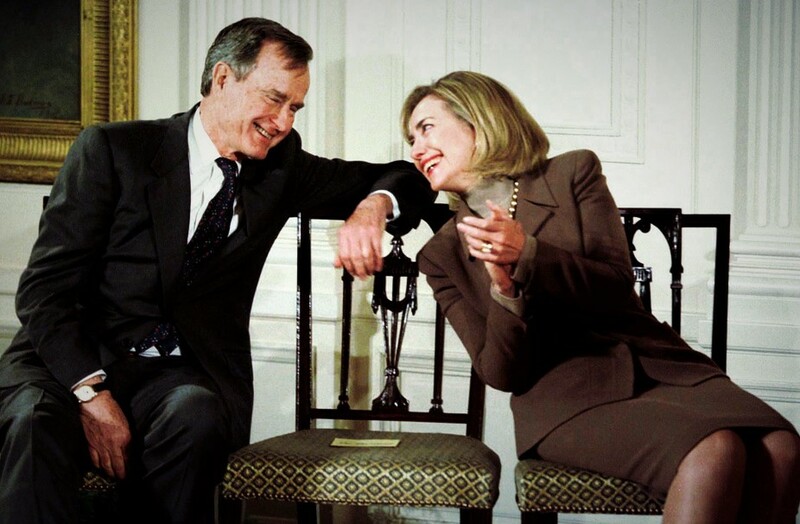 One of the most respected men in the history of the American presidency, George H. W. Bush, has let it slip that he’s voting for the wife of his former adversary Bill Clinton. 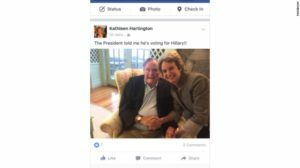 In a post on her Facebook page, Kathleen Hartington, the daughter of Robert F. Kennedy, wrote that Bush told her Monday morning he would be voting for Hillary Clinton. Kathleen Hartington shares her picture with former President Bush. Bush spokesman Jim McGrath late Monday night did not deny the news, and Hartington, the former Lt. Gov. of Maryland, would not have released it without the permission of George and Barbara Bush. You could say Bush’s support of Clinton is not really a shock. After all, Donald Trump once called for the impeachment of his son President George W. Bush. But it is shocking. George Bush is a living former Republican president who represents what an entire generation of Americans admired: Ethical, educated and informed, hard working, a strong leader through times of war, yet willing to compromise, on behalf of the country, in times of peace. George Bush is the anti-Trump. We have reached the moment when the GOP has moved so far away from the principals of George Bush that he is now voting for the Democratic nominee for president. The founding director of the George W. Bush presidential library endorsed Hillary Clinton last month. Glassman joins David Nierenberg, one of Mitt Romney’s original national finance committee chairs, in publicly backing Clinton. The endorsements come as the nation’s top defense contractors, long a bastion of support for Republican presidential candidates, are now contributing to Clinton’s campaign by a ratio of 2-to-1. Two former chairmen of the White House Council of Economic Advisors have also announced they will not back Trump. Former MGM CEO Harry Sloan, a Republican fundraising giant, has announced he cannot support Trump. A former political director for President Ronald Reagan, Frank Lavin, said earlier this month he is backing Hillary Clinton. Former commerce secretary Carlos Gutierrez; former housing and urban development secretary Carla Hills; former congresswoman Connie Morella; former congressman Chris Shays; and former director of national intelligence John Negroponte all endorsed Clinton earlier this month. Sen. Susan Collins, the senior senator from Maine, does not back Trump. Sen. Jeff Flake has not endorsed Clinton, but says Trump could cost the GOP control of the U.S. Senate. President George W. Bush’s former deputy assistant and deputy press secretary Tony Fratto also backs Clinton. Wadi Gaitan, the mouthpiece of the Florida Republican Party, quit earlier this year due to Trump. “I’m thankful for my almost two years with the Florida GOP, however, moving on gives me a great, new opportunity to continue promoting free market solutions while avoiding efforts that support Donald Trump,” said Gaitan who is Latino. The former chief policy director for Republicans in the House, Evan McMullin, has launched an independent, conservative bid for president because of Trump. Another former top aide of President George W. Bush, Lezlee Westine, announced her support of Hillary Clinton. “Because I feel so strongly about our nation’s future, I will be joining the growing list of former and present government officials in casting my vote for Hillary Clinton for president in 2016,” said Milliken. Over 50 GOP national security experts, including former secretary of Homeland Security Michael Chertoff and former C.I.A. director Michael Hayden, have signed a statement of opposition to Trump. William D. Ruckelshaus, the EPA administrator during the Nixon and Reagan administrations, and William Reilly, the EPA administrator during the Bush administration, both endorsed Hillary Clinton. Illinois Rep. Adam Kinzinger, an up-and-comer in the GOP, has also announced he cannot vote for Trump in November. In California, Meg Whitman, a top GOP financial supporter, endorsed Hillary Clinton last month. In Ohio, a state considered a must-win for Trump, the former popular Attorney General Betty Montgomery announced she will not vote for Trump. The state auditor in Ohio Dave Yost, a likely candidate for attorney general in 2018, is not backing the GOP nominee. Ohio Governor John Kasich has not endorsed the GOP nominee and skipped the convention in Cleveland last month. Kasich says he does not believe Trump can win the Buckeye State. Ohio is viewed as critical to Trump’s chances to winning 270 electoral votes. No Republican in history has won the White House without carrying it. Sally Bradshaw, a longtime aide to Jeb Bush, and Maria Comella, a former top aide to New Jersey Gov. Chris Christie have also recently renounced Trump’s candidacy. Mike Fernandez, a Miami billionaire and longtime GOP fundraiser, has endorsed Clinton, comparing Trump to a scorpion. “As a Republican who has contributed millions of dollars to the party’s causes, I ask: ‘Why has our party not sought a psychological evaluation of its nominee?’” said Fernandez. Former New Jersey Governor Christine Todd Whitman, the EPA director during the Bush administration, also plans to vote for Hillary Clinton. Former Pennsylvania Governor Tom Ridge, who was also America’s Homeland Security Director, says 2016 will be the first time in his life he hasn’t voted for the Republican presidential nominee. Former Senator Larry Pressler endorsed Clinton after the Orlando shooting. Rep. Richard Hanna, a Republican from Trump’s home state of New York, announced he’ll vote for Hillary Clinton, becoming the first sitting GOP member of congress to cross party lines. Hanna is not alone. Longtime GOP national security adviser Brent Scowcroft endorsed Clinton too. Richard Armitage, the deputy secretary of state under George W. Bush, and the assistant secretary of defense under Ronald Reagan, has endorsed Clinton. George W. Bush’s former Treasury Security, Hank Paulson, also backs the Democratic nominee. The former Republican mayor of New York City, Michael Bloomberg, has questioned Trump’s sanity and called him a con man. Maryland Governor Larry Hogan says he’ll “write someone in” besides Trump in November. Matt Higgins, former New York City Mayor Rudy Giuliani’s press secretary, says his 9-year-old son helped him make the decision to back Clinton. “Since you’re a Republican, do they make you vote for the Republican?” his son asked after Trump’s acceptance speech. Higgins, a lifelong Republican, is now fundraising for the Democratic nominee. Kevin Madden, a key strategist and national press spokesman for Mitt Romney’s presidential campaign in 2012, says he’ll put character ahead of party in this election. Nebraska Sen. Ben Sasse says Republicans should write-in another name on the ballot. Illinois’s Mark Kirk, South Carolina’s Lindsey Graham, and Texas’s Ted Cruz also do not support Trump. Rep. Scott Rigell, of battleground Virginia, says he is voting for Libertarian presidential nominee Gary Johnson instead of the GOP nominee. Former Rep. J.C. Watts says he’ll write-in a candidate before voting for Trump. “It’s going to be a tremendous setback for the party if he wins,” he said. Conservative columnist George Will said last month a Clinton term is less dangerous for the nation than Trump. While not endorsing Clinton, George W. Bush, along with former Florida Governor Jeb Bush, have announced they will not vote for Trump. Mitt Romney, the 2012 GOP nominee, also has said he will not back Trump.